Here is the Ultimate Seven Knights Hero List of the Seven Knights faction with stats including; HP, rank, attacks, defense, skills, how to acquire heroes and much more! 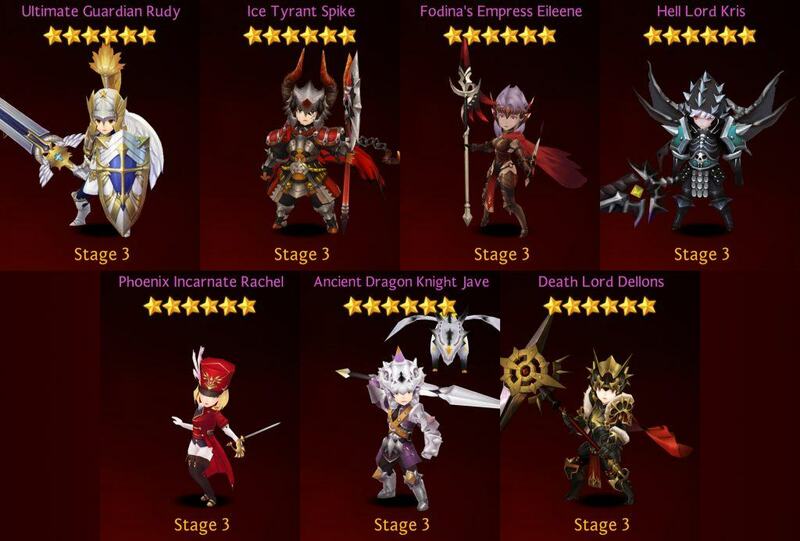 This is a great guide to understand how to obtain the special heroes, learn their background, see how they evolve from from rank 4 to ultimate rank 6, plus learn how their special skills can be useful in your campaigns for conquest. Read our full review on Seven Knights for an overview of the entire game… and let’s demystify some of the complex upgrade system so you can use to your advantage! Remember this article only focuses on the Seven Knights faction. We will follow up with in-depth insider info on other factions such as Evan’s Expedition, Four Lords, Emperors, etc. Below you will find three tables with slightly different information. The key differences are Rank, HP (base), Physical Attack (base), Defense (base), Speed, and various percentages in all Skills. As you can see we have listed the base stats for HP, Physical Attack and Defense. These numbers increase as you Level Up, Power Up or increase both in combination. For example, if you acquire Ultimate Guardian Rudy and Level Up to max level 40 plus Power Up to max +5 his stats would read: HP 5073, Physical Attack 1315, Defense 1330. We will offer an online Seven Knights calculator soon for you to compute stats yourself. The main goal of being familiar with these figures and knowing about hero skills is to give you a competitive advantage while playing. Knowing when to use or when not to use a skill in battle can make the difference in success or defeat in tough bouts. You may ask, “How do I collect one of the Seven Knights?” Although the game will tell you each character is unveiled in mystery, you can find them with either Seven Knight Tickets, Seven Knight Selector, Fusion, or Topaz Shop. Lastly, in order to upgrade the Seven Knights to Stages 2 & 3 (Rank 5 & 6 respectively) you must find elements in Adventure mode by defeating Mimics. Defensive 1028 280 284 15 Rush. Inflicts 180% Physical Damage on 1 enemy Stuns the enemy for 2 turns at a certain rate. Reduces the enemy’s buff duration by 3 turns. 80 Defense Preparation. Reduce all Damage received by 65% and Immune to debuffs for 2 turns. (If already hit with the Death effect, receive 100% Physical Attack as damage.) 74 Sturdy Shield (Unique Passive Effect). Increase all allies’ Defense by 25%. Rudy and Kris were inseperable until the competition for the Throne of Light destroyed their friendship. Rudy now guards Terra for Kris. Universal 890 386 259 17 Severe Cold Strike. Attack an enemy with 180% of Physical Attack. With certain rate, Chill the target for 2 turns, dealing 130% of Physical Attack after duration. (Chill damage ignores the target’s Defense.) 74 Severe Cold Earthquake. Attack all enemies with 70% of Physical Attack. With certain rate, Chill 1 or more targets for 2 turns, dealing 70% of Physical Attack after duration. (Chill damage ignores the target’s Defense.) 94 Severe Cold Heart (Unique Passive Effect). Protects all allies from debuffs for 2 turns. Additionally, blocking will take effect and increases the Critical Rate of all allies by 20%. Unconfirmed rumors say Spike is the son of Queen Lania. His bitter cold heart allows him to use powerful Ice Magic as a Berserker. Universal 890 386 259 17 Thunder Lord’s Fury. Inflicts 200% Physical Damage on 1 enemy. Additionally, piercing will take effect, and Electrifies the enemy for 2 turns at a high chance. 64 Celestial Bolt. Inflicts 80% Physical Damage on all enemies. Electrifies one target or more at a certain rate for 2 turns. 74 Fodina’s Rage (Unique Passive Effect). Increases the Physical Attack of all allies by 25%. Additionally, revives once with 50% HP. Regardless of race or gender, power determines everthing in Silent Mine. This is how Eileene came into power. Universal 890 386 259 17 Strike of Darkness. Inflicts 180% Physical Damage to 1 enemy. Additionally, Kill the target after 2 turns. (Damage the target with 100% Attack if the target is Immune to all debuffs.) 64 Whisper of Darkness. Inflicts 70% Physical Damage on all enemies. Kill one target or more at a certain rate after 2 turns. (Damage the target 100% Physical Attack if the target is Immune to all debuffs.) 76 Soul Drain (Unique Pasive Effect). When an enemy dies, all allies recover HP by 15%. Additionally, if killed, you will revive the Immortality of 3 turns. Normal attacks are Critical Hits during this state. (This effect also applies to Counterattack and Speed Attack. Kris used to be a knight of Light with Rudy. However, he sided with the Darkness after losing the Throne of Light to Rudy. Universal 890 386 259 17 Blaze. Inflicts 180% Physical Damage on 1 enemy. Burns the enemy with 80% of Physical Attack for 2 turns. 70 Phoenix. Inflicts 120% Physical Damage on 3 enemies. Additionally, decreases the enemies’ Damage and Defense by 60% for 2 turns. 74 Power of Flame (Unique Passive Effect) Increase all allies’ Counterattack Rate by 35%. Revive once with 60% HP. Also, power up skills for 3 turns. Rachel is the eldest daughter of the Royal Agni Family. Rachel’s graceful disposition masks her powerful inner fire spirit. Universal 890 386 259 17 Furious Strike. Attacks all enemies with 80% Physical Attack. Ignores the target’s Defense. 70 Dragon Fury. Inflicts 80% Physical Damage on all enemies. Piercing guaranteed. 70 Armor of Revenge (Unique Passive Effect) Reduce damage received by 25% and return the reduced damage to the attacker. Jave was abandoned in Dragon Ruins by his unknown parents. He grew up under the protection of the guardian of the ancient ruins. Offensive 657 413 202 21 Deadly Strike. Inflicts 180% Physical Damage on 1 enemy. Additionally, piercing will take effect. 74 Advent Grim Reaper. Inflicts 120% Physical Damage on 3 enemies. Silence one target or more at a certain rate for 2 turns. 84 Boundary of Death (Unique Passive Effect) Becomes immune to all damage for 2 turns and increases the Damage of all allies by 25%. It is not known how Dark Knight Dellons became a Grim Reaper. Judging by his hesitation to cause harm, perhaps he isn’t a full Reaper just yet. Defensive 1339 355 358 17 Rush. Inflicts 200% Physical Damage on 1 enemy Stuns the enemy for 2 turns at a certain rate. Reduces the enemy’s buff duration by 3 turns. 80 Defense Preparation. Reduce all Damage received by 70% and Immune to debuffs for 2 turns. (If already hit with the Death effect, receive 100% Physical Attack as damage.) 74 Sturdy Shield (Unique Passive Effect). Increase all allies’ Defense by 40%. Heroes bestowed the title of Light Guardian onto Rudy for being the protector of Mystic Woods. Universal 1166 497 329 19 Severe Cold Strike. Attack an enemy with 200% of Physical Attack. With certain rate, Chill the target for 2 turns, dealing 140% of Physical Attack after duration. (Chill damage ignores the target’s Defense.) 74 Severe Cold Earthquake. Attack all enemies with 80% of Physical Attack. With certain rate, Chill 1 or more targets for 2 turns, dealing 80% of Physical Attack after duration. (Chill damage ignores the target’s Defense.) 94 Severe Cold Heart (Unique Passive Effect). Protects all allies from debuffs for 2 turns. Additionally, blocking will take effect and increases the Critical Rate of all allies by 30%. Spike became the Ice Judge of the Frozen Land by unleashing his savage berserker skills. He dreams of making the Frozen Land the most powerful region of Terra. Universal 1166 497 329 19 Thunder Lord’s Fury. Inflicts 230% Physical Damage on 1 enemy. Additionally, piercing will take effect, and Electrifies the enemy for 2 turns at a high chance. 64 Celestial Bolt. Inflicts 90% Physical Damage on all enemies. Electrifies one target or more at a certain rate for 2 turns. 74 Fodina’s Rage (Unique Passive Effect). Increases the Physical Attack of all allies by 40%. Additionally, revives once with 80% HP. Eileene earned her title of Supreme Commander through her rising strength and excellent leadership. She plans to expand Silent Mine. Universal 1166 497 329 19 Blaze. Inflicts 200% Physical Damage on 1 enemy. Burns the enemy with 90% of Physical Attack for 2 turns. 70 Phoenix. Inflicts 140% Physical Damage on 3 enemies. Additionally, decreases the enemies’ Damage and Defense by 70% for 2 turns. 74 Power of Flame (Unique Passive Effect) Increase all allies’ Counterattack Rate by 40%. Revive once with 80% HP. Also, power up skills for 3 turns. Rachel became the Flame Ruler of Blazing Desert by learning to control the flames. She was considered the best even within the Agni Family. Universal 1166 497 329 19 Furious Strike. Attacks all enemies with 90% Physical Attack. Ignores the target’s Defense. 70 Dragon Fury. Inflicts 90% Physical Damage on all enemies. Piercing guaranteed. 70 Armor of Revenge (Unique Passive Effect) Reduce damage received by 30% and return the reduced damage to the attacker. Jave learned how to use the magic and speak the Human language from his guardian patron. He protects Dragon Ruins alongside other dragons. Offensive 850 532 256 25 Deadly Strike. Inflicts 200% Physical Damage on 1 enemy. Additionally, piercing will take effect. 74 Advent Grim Reaper. Inflicts 140% Physical Damage on 3 enemies. Silence one target or more at a certain rate for 2 turns. 84 Boundary of Death (Unique Passive Effect) Becomes immune to all damage for 2 turns and increases the Damage of all allies by 30%. Dellons has completed his transformation into a Grim Reaper, killing everything in his path through Dark Grave. Defensive 5073 1315 1330 19 Rush. Inflicts 230% Physical Damage on 1 enemy Stuns the enemy for 2 turns at a certain rate. Reduces the enemy’s buff duration by 3 turns. 80 Defense Preparation. Reduce all Damage received by 80% and Immune to debuffs for 2 turns. (If already hit with the Death effect, receive 100% Physical Attack as damage.) 74 Sturdy Shield (Unique Passive Effect). Increase all allies’ Defense by 60%. As the long-standing protector of Mystic Woods, and earning a place on the THrone of Light, Rudy was acknowledged as the Ultimate Guardian by the people. Universal 1486 637 415 21 Severe Cold Strike. Attack an enemy with 230% of Physical Attack. With certain rate, Chill the target for 2 turns, dealing 160% of Physical Attack after duration. (Chill damage ignores the target’s Defense.) 74 Severe Cold Earthquake. Attack all enemies with 90% of Physical Attack. With certain rate, Chill 1 or more targets for 2 turns, dealing 100% of Physical Attack after duration. (Chill damage ignores the target’s Defense.) 94 Severe Cold Heart (Unique Passive Effect). Protects all allies from debuffs for 2 turns. Additionally, blocking will take effect and increases the Critical Rate of all allies by 40%. A self-made tyrant with plans to immerse the world in the biter cold. It seems that Spike won’t stop until his frozen heart is thawed. Universal 1486 637 415 21 Thunder Lord’s Fury. Inflicts 250% Physical Damage on 1 enemy. Additionally, piercing will take effect, and Electrifies the enemy for 2 turns at a high chance. 64 Celestial Bolt. Inflicts 100% Physical Damage on all enemies. Electrifies one target or more at a certain rate for 2 turns. 74 Fodina’s Rage (Unique Passive Effect). Increases the Physical Attack of all allies by 40%. Additionally, revives once with 80% HP. Eileene became the Empress of Fodina because of her supreme leadership and strength. Her plan to expand Silent Mine is ready to be executed. Universal 1486 637 415 21 Strike of Darkness. Inflicts 230% Physical Damage to 1 enemy. Additionally, Kill the target after 2 turns. (Damage the target with 100% Attack if the target is Immune to all debuffs.) 64 Whisper of Darkness. Inflicts 90% Physical Damage on all enemies. Kill one target or more at a certain rate after 2 turns. (Damage the target 100% Physical Attack if the target is Immune to all debuffs.) 76 Soul Drain (Unique Pasive Effect). When an enemy dies, all allies recover HP by 30%. Additionally, if killed, you will revive the Immortality of 3 turns. Normal attacks are Critical Hits during this state. (This effect also applies to Counterattack and Speed Attack. Kris the Dark Conqueror became Lord of the Underworld. He is preparing to invade Terra. Universal 1486 637 415 21 Blaze. Inflicts 230% Physical Damage on 1 enemy. Burns the enemy with 100% of Physical Attack for 2 turns. 70 Phoenix. Inflicts 160% Physical Damage on 3 enemies. Additionally, decreases the enemies’ Damage and Defense by 80% for 2 turns. 74 Power of Flame (Unique Passive Effect) Increase all allies’ Counterattack Rate by 50%. Revive once with 100% HP. Also, power up skills for 3 turns. After becoming the ruler of Blazing Desert, she gave herself the title of Phoenix Incarnate. She is on edge due to the recent invaders in Blazing Desert. Universal 1486 637 415 21 Furious Strike. Attacks all enemies with 100% Physical Attack. Ignores the target’s Defense. 70 Dragon Fury. Inflicts 100% Physical Damage on all enemies. Piercing guaranteed. 70 Armor of Revenge (Unique Passive Effect) Reduce damage received by 40% and return the reduced damage to the attacker. Once he became of age, Jave became the Ancient Dragon Knight and rose to rule Dragon Ruins. Offensive 1086 696 328 31 Deadly Strike. Inflicts 230% Physical Damage on 1 enemy. Additionally, piercing will take effect. 74 Advent Grim Reaper. Inflicts 160% Physical Damage on 3 enemies. Silence one target or more at a certain rate for 2 turns. 84 Boundary of Death (Unique Passive Effect) Becomes immune to all damage for 2 turns and increases the Damage of all allies by 40%. Dellons regained his sanity and went on to become ruler of the unclaimed Dark Grave. He now commands the Undead army from this area. If you found this data useful, please use and link back to us. Play Seven Knights on PC via BlueStacks. Have any question? Comment below! 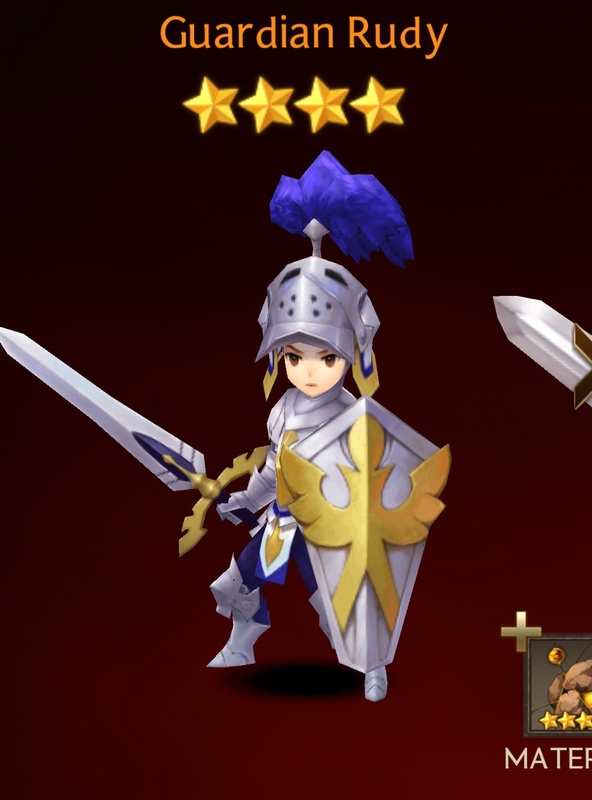 How to get Seven Knights heroes?